Discussion in 'Current Events' started by Plutonius, Jun 28, 2014. I always think of his character first whenever people mention the movie "The Good, the Bad, and the Ugly". 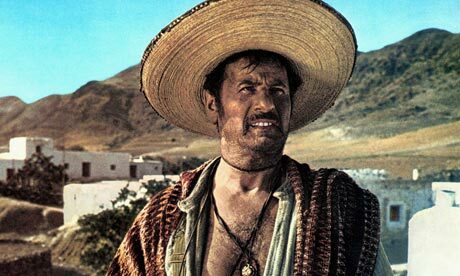 I always think of his character whenever people mention the movie "The Good, the Bad, and the Ugly". Wallach was one of the new breed of "method" actors in his youth, along with Brando, Montgomery Clift, John Garfield, and others. They revolutionized film acting forever. Although "The Good, The Bad, And the Ugly" is possibly his best known film by a somewhat younger audience, his earlier films revealed a deeper acting talent which he displayed admirably. Never a huge star, or leading man type, he, and others, were more like superb character actors (I like character actors more than "stars", generally). His body of work remains, and his early work is very much worth viewing. Actually, I tend to think of Lee Van Cleef, when discussing that particular movie, but then, (I may have mentioned it elsewhere, but, um, I am rather an fan of Lee Van Cleef). Especially his first starring film role in "Baby Doll" (1956). This film was also Wallach's personal favorite, so that says a lot. I don't see Wallach as a character actor. Though he was often cast in tough guy roles (and they stuck with his image, obviously), he played a much wider variety of parts than are generally associated with character actors. And FWIW, some big stars were essentially character actors. John Wayne, for one. Nobody played John Wayne better than John Wayne. Nevertheless, Eli Wallach was one of those great, rugged, reliable, utterly solid actors, and was a wonderful character actor as well Indeed, in common with Shrink, personally, I much prefer character actors to any number of vapid, blandly anonymous, handsome lead actors devoid of personality or…….dare one mention it, character……..
As above, I don't think of Wallach as a character actor, simply because he was never a huge star. He was more in the Brando mold, an actor who could disappear into his parts. Belated R.I.P. but... The Good, The Bad and The Ugly, for me, Eli rode away with that movie. I enjoy Lee Van Cleef quite a bit, but once Tuco comes on, it is hard to focus on Angel Eyes. Eli wrote a great book about his years in Hollywood. It's very interesting. That was all I saw him in, but he stole the show. I love the way he through himself into it, and the ending where the theme came in was perfect. He made a name playing bad guys, one of my favorite character actors. I was not a fan of the Spaghetti Westerns, my favorites were Charlie Gant in How The West Was Won and Calvera in The Magnificent Seven. He also played The General in Lord Jim which I need to watch again, if I can find it. How The West was Won filmed in "Cinerama" was an incredible experience, larger than life, 3 cameras side by side, that Wallach played a great role as a colorful and charismatic outlaw. Cinerama rivals, in some ways out does IMAX. Look at the full size theater images to have your socks knocked off! That's right, he was the baddie in the Magnificent Seven. Thanks for the refresher.